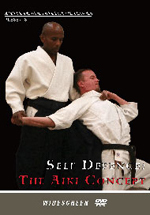 A continuation from “Restraint & Removal: The Aiki Concept”, this DVD further demonstrates the applications of aikido outside the dojo with self-defence as the focus. It provides you with an insight into what aikido can lead to once you have mastered the basics and are able to maintain control of your body. Each of the ten techniques, from various attacks is shown in different settings and an in-depth description is given prior to the technique demonstrated. The techniques are shown in both slow motion and with close-up still images, enabling the viewer to appreciate the workings of the technique. In addition, the menu format allows easy navigation for repeated viewings of the same technique. This production will inspire martial artists to discover the concepts behind techniques and apply them in practical situations.